1916 was a year that began with great optimism for the allies. By 1915 large numbers of new British Army divisions had begun to arrive in France, most of these being “The New Army” divisions, made up of the enthusiastic volunteers who had flocked to join the army at the outbreak of war. At the end of 1915 the allies had agreed to launch a series of coordinated attacks against Germany and her Austrian ally in 1916 and, as their contribution, Britain and France planned a major offensive across the River Somme. The plan to attack across the Somme was a political compromise. The British commander, Haig, would have preferred to launch an attack further North in Belgium, but the French commander Joffre wanted an attack in which the two allies fought side by side. The Somme was where the two armies met, the British holding the trenches from just north of the river to Belgium and the French holding the trenches south to the Swiss border. If British and French troops were to attack side by side it had to be on the Somme, but beyond this there was no strategic reason why this area was chosen for the site of the battle. However, the German attack on Verdun, which began in February 1916, dramatically changed plans for the Somme battle. Germany’s assault on Verdun was designed to force France out of the war and as the battle intensified, the French contribution to the Somme attack was reduced. More and more French troops were diverted to Verdun and when the Somme battle opened on 1 July it was largely a British offensive. Nineteen British divisions were to attack to the North of the River Somme and three French divisions were to attack to the South. Nearly 3,000,000 shells were made available for a massive artillery bombardment to precede the attack. It was confidently expected that German defences would be completely destroyed, that the German barbed wire would be cut and that any German survivors would be incapable of putting up any effective resistance. In addition, a series of mines were also to be exploded under key German positions. Concerns about the lack of experience of most of the men taking part in the attack resulted in the infantry being ordered to walk across no man’s land in extended lines or “waves.” Traditional infantry tactics involved soldiers in advancing on the enemy in small groups, each running forward in turn while other groups gave them covering fire. It was believed that the New Army men were not capable of such tactics and that, anyway, the artillery bombardment would have ensured that no Germans were left to resist. Most of the attacking troops were part of the Fourth Army, commanded by General Rawlinson. Rawlinson wanted to advance in stages, capturing each German defence system in turn. Haig overruled this and insisted that the first day’s objectives should include capturing the first two systems of the German defences. Cavalry were gathered behind the lines in order to break out into open countryside if the German defences were breached. The 1 July was the most disastrous day in the history of the British Army. Ten minutes before the attack, the artillery began to lift from the German front lines and onto targets further back. At 7.30am British infantry climbed out of their trenches, formed up into waves and began to move forward, each man carrying at least 60 pounds of equipment. The vast majority of these men were stopped in no man’s land, many cut down by German machine guns and others by the German artillery which began to lay down a defensive barrage in front of their trenches. 60,000 casualties were suffered on the first day of the battle, almost 20,000 of these being killed. In the South, the villages of Mametz and Montauban were captured by the British and the French also secured their objectives, but elsewhere the attack was a failure. The explanation in the failure of the attack on 1 July is largely explained by the over reliance placed on the effectiveness of the artillery bombardment. Too many of the guns involved were small calibre field guns, many of the inexperienced gunners lacked the skills to implement the artillery plans and too many shells were “duds.” Attacking the depth of two German defence systems also meant that the bombardment was not sufficiently concentrated on essential targets. In addition, the British commanders underestimated the German defences. In almost two years on the Somme, the Germans had constructed a massive defensive system of trenches, barbed wire, villages fortified by concrete and dugouts. Throughout the bombardment, the German defenders had sheltered in dugouts 30 feet below the ground. Although they had suffered terrible strain and had gone without regular food and drink, they had survived to bring up their machine guns into their battered trenches to meet the lines of British soldiers walking towards them. The disaster of the first day, however, was never repeated. The Somme became the great learning ground of the British Army, though at great cost. Tactics changed very quickly, paving the way for eventual victory. 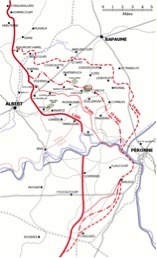 A series of attacks took place over the next four and a half months, some with considerable success, in which the Germans were progressively pushed back until The Somme Campaign came to an end on 17 November. Some of these attacks were localised attempts to capture isolated objectives, such as the Welsh Division attack on Mametz Wood in July and the Australian attack on Pozières in August. Other attacks were on a much broader front, such as the attack on the Bazentin Ridge and the Flers-Courcellete attack in September which saw the first use of tanks. The weather deteriorated in October and November and fighting took place in a sea of glutinous mud. Haig was became convinced that the German Army was about to break and that one more attack would prove decisive. The Germans suffered enormously in the attacks and, although pushed back, they certainly never collapsed. When further attacks became impossible due to conditions on the ground, the British had advanced seven miles at the furthest point, but Bapaume, the main objective of the first day of the battle, was still in German hands. The British had suffered 420,000 casualties, the French 195,000 and German casualties amounted to 600,000. The cost to some local communities in Britain from which “The Pals” battalions had been raised was enormous. 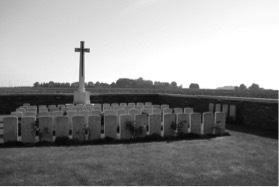 The Somme also marked a turning point in the war, at which the optimism and idealism of the early years disappeared and people began to realise the reality of a grim and costly struggle if victory was to be achieved. Yet some historians see the Somme as a major British victory. The British army emerged as a much more effective fighting force. The German army suffered greatly and Germany’s hope of ultimate victory was cast in grave doubt. Following the battle, the Germans gave up much of the ground held in France and withdrew to the Hindenburg Line. Many historians believe that Germany’s ultimate collapse can be traced back to the Somme.